I made this card for a friend who is moving interstate today. 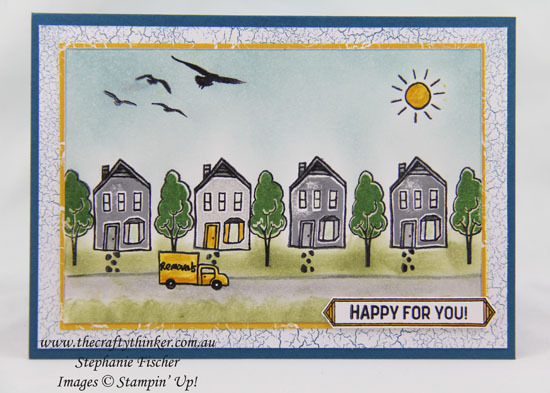 I used the new hostess stamp set called In The City which will be available from 1st June using Stampin' Rewards from a qualifying party. The background paper is the new Colour Theory Designer Series Paper. I hand wrote the word Removals on the truck for this particular card. 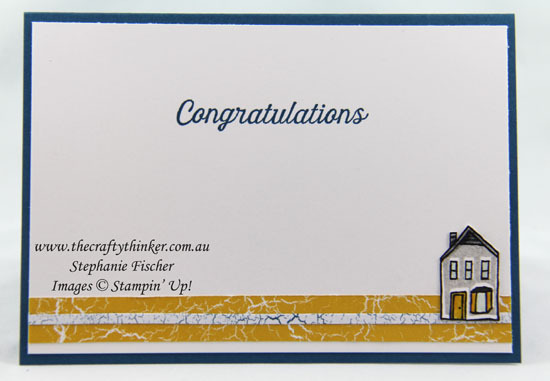 The stamped banner is from the new Happy Birthday Gorgeous stamp set and it matches with the Classic Label Punch. This is the kind of stamp set that really appeals to me because it's so versatile. For this card I only used the image of the small house and one tree because a city scape wasn't appropriate. However, the set covers many occasions from moving to a new neighbourhood, getting married or the arrival of a new baby and more. The other thing that I really like about the set is that the two step stamping makes really quick and easy work of building a scene!